How is Samsung like New York City? Well, it’s practically city-sized; it never sleeps; and it’s constantly trying to reinvent itself to stay ahead of the game. Shaky similes aside, Samsung, the world’s biggest smartphone manufacturer, has turned its attention recently to tablets with its new Tab S line. Available in 8.4″ and 10.5″ varieties, both devices sport similar specifications and absolutely stunning Super AMOLED screens with resolutions of 2560×1600, in ultra-slim bodies and ‘premium’ designs, that reinforce the company’s intentions as the top Android tablet manufacturer. In truth, the Tab S lineup is little changed from the TabPRO series that we looked at earlier in the year, replacing Snapdragon chips for its own octa-core variety of Exynos chip, sleeking up the bezels and adding a fingerprint scanner that debuted on the Galaxy S5. 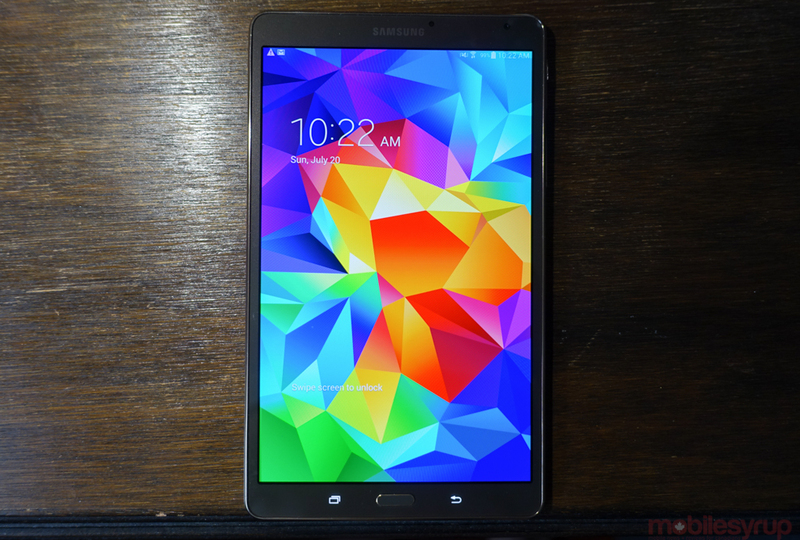 But the important thing to note that is the Tab S will be the company’s flagship tablet series going forward, leaving the cheaper Tabs as the entry-level product and the PRO series in limbo. At $419.99, the Tab S 8.4 is the closest thing to a true iPad mini with Retina competitor we have — but is it worth buying? If you’re an Android diehard, we think so. 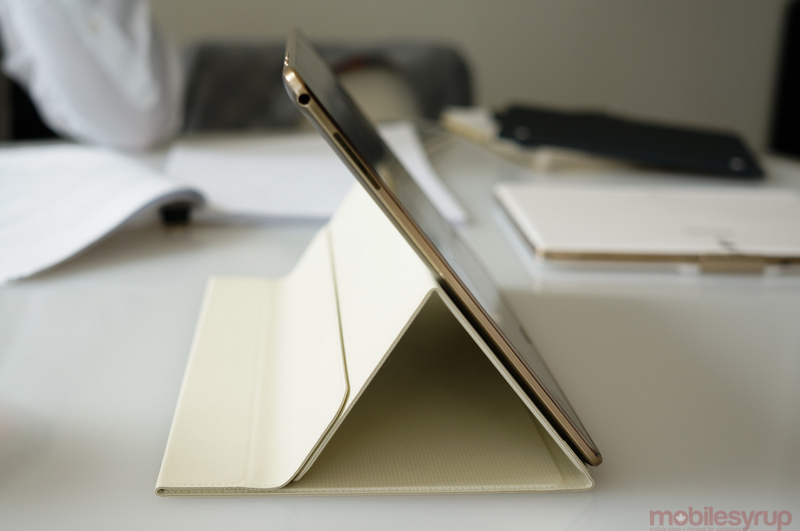 The Tab S 8.4 is, first and foremost, a really easy tablet to hold in one hand. It’s slimmer and taller than the iPad mini with Retina, but more importantly weighs some 30 grams less. Its plastic build isn’t going to win awards for design, but Samsung has managed to slim down the 8-inch tablet to a footprint only slightly larger than the much-cheaper Tab 4 7.0. We’ll get to software in a minute (because it’s actually quite good), but first the screen. This is one of the nicest screens I’ve ever seen on a tablet. AMOLED, which has typically been cost ineffective to scale to larger sizes, works beautifully for the kinds of media-intense use cases expected here. Colours are rich and brightness is excellent, and the usually blue inflection one sees in whites is largely absent here. Viewing angles, too, something that matters more on a shared-experience tablet than a smaller smartphone, are IPS-calibre. Aside from its svelte new body and gorgeous new screen, the Tab S takes a page from the Galaxy S5 with its dimpled backing. And those holes on the side? Clips for a new smart cover design that, as seen in the video, securely attaches to the tablet to protect, prop and otherwise enhance the overall experience. Unlike Apple’s own Smart Cases, the Book Case has three angles with which to prop the tablet: one for typing and two for comfortable media viewing. The clips themselves may mar the symmetry of the device’s back, but they do make for a much sturdier accessory as a result, and it’s one of those times that function wins out over form. Because the tablet itself is only 6.6mm thick, it slips unburdened into a bag or purse, even with the cover attached, and there’s the right amount of heft without feeling cumbersome. While I preferred the faux-leather backing of the slightly-larger TabPRO 8.4, the Tab S of the same size feels like a more well-considered product, and its advantages, especially with the integration of a multi-user facilitating fingerprint scanner, are numerous. The Android 4.4.2-based software is also quite impressive. Samsung finally appears to have found equilibrium between quirky complicated and feature-full choice. 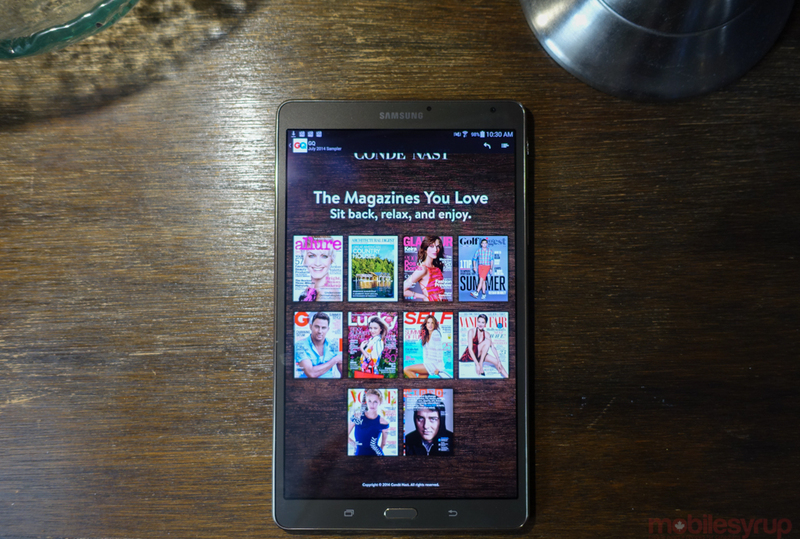 The Magazine UX we saw on the TabPRO is still here, but the widget-heavy home screen runs considerably smoother thanks to the Exynos 5420 chip, and is no longer the default view upon first boot. 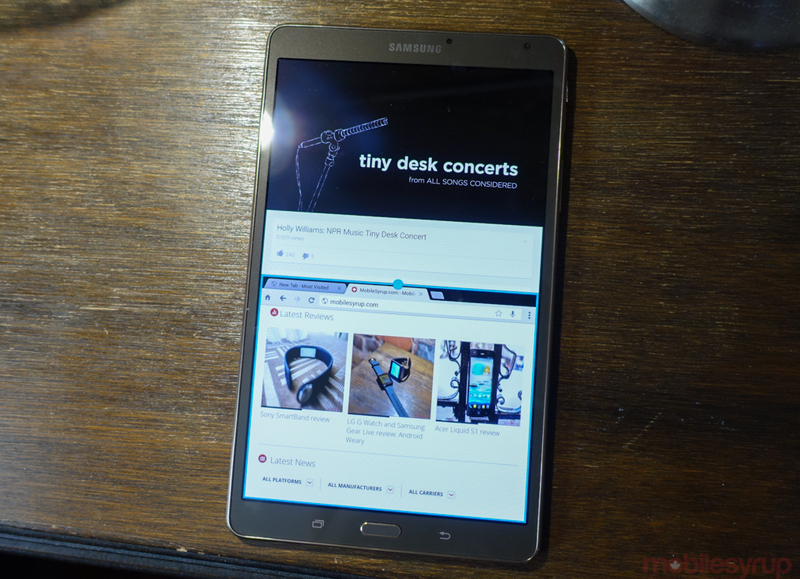 Samsung’s Multi Window feature, which runs two apps simultaneously, has proven to be quite useful on tablets, especially since users tend not to bounce between apps like they do on phones. For example, I spent most of my time with Twitter on one panel and Chrome on the other, and it operated much like my MacBook. 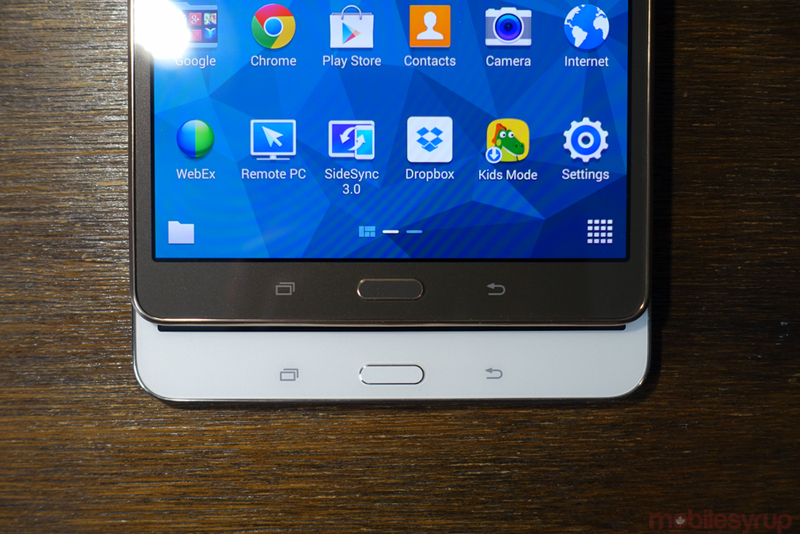 The Tab S also gets some benefits from partnerships with other companies: Samsung gives users 12 months of free Globe And Mail reading with the new Android tablet app, while Marvel, Dropbox, BusinessWeek and Evernote all get some love, too. The company rightfully understands that it can no longer differentiate on software alone — LG, Sony and many others emulate its best features, and improve on its worst, in both the smartphone and tablet space — so these value adds are extra incentives to choose a Samsung Tab over a competing iOS or Android slate. 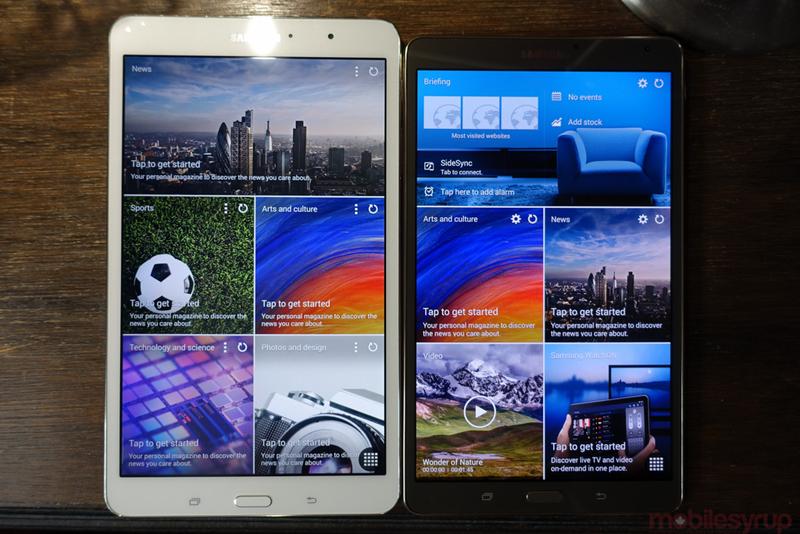 I’ve said it many times, but I prefer the portrait tablet form factor to the horizontal one in the Android space. While most newer apps have been designed with tablet specifications in mind, there are thousands of others that still haven’t — and they look far better blown up on an 8.4-inch display than a 10.5-inch one. Samsung’s done a great job partnering with the right companies to ensure top compatibility — and performance — with certain apps, and that work shines through here. 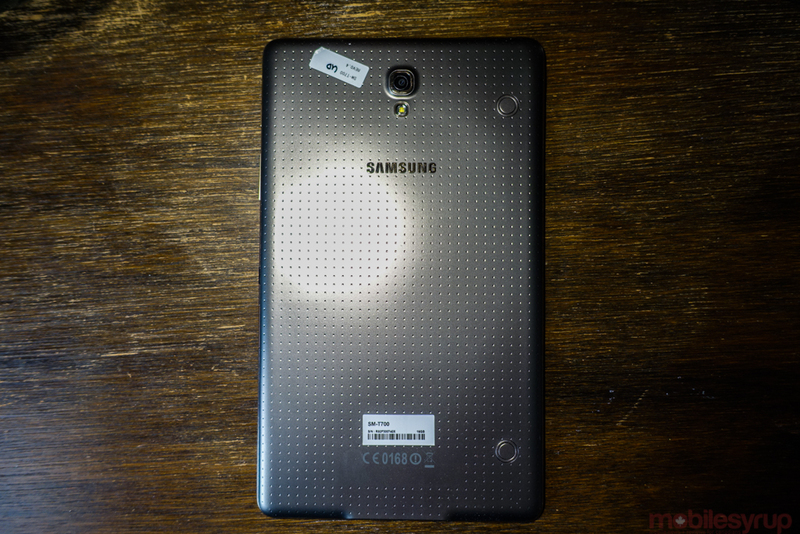 Finally, the fingerprint scanner works better on the Galaxy Tab S than it does the Galaxy S5. It’s not an improved scanner but merely a different use case. There’s more room to swipe a finger, and users tend to hold a tablet in two hands anyway, whereas the GS5 encourages one-handed unlocking,which tends to be finicky at best. The scanner also enables a unique multi-user mode that makes the tablet — especially the larger 10.5-inch model — a great living room fixture, as the device can be set up to allow kids access to their favourite apps and nothing else, while parents have peace of mind that they won’t need to teach a password. As much as I enjoyed the experience of using the Tab S 8.4, and feel it’s Samsung’s best slate to date, there’s something still incomplete about using Android in a tablet format. Samsung doesn’t make that first impression any better by forgetting to debug certain aspects of the OS, too. While slowdown and app crashes were less common on the Tab S than they have been on slates of the past, I would find myself swiping across the home screen or attempting to open an app to little or no effect; the OS has yet to catch up to my input. This was not an isolated incident, either, and is neither welcome nor excusable on a device with four Cortex-A15 chips, a super fast six-core GPU and 3GB of RAM. Speaking of specs, that the device only has 16GB of internal storage still irks; while it’s excusable on a phone, Samsung needs to understand that tablets are media consumption-heavy products and require more storage space without the added hassle of exchanging microSD cards. This is doubly true after Google limited what can be stored on those cards for security reasons. Battery life, too, was lower than the equivalent TapPRO, since Samsung slimmed both models of the Tab S to be as svelte as possible. The 4,900mAh battery is only 50% larger than most current smartphones, and while usage tends to be different between all-day devices and tablets, I still found myself having to charge the Tab S every night. 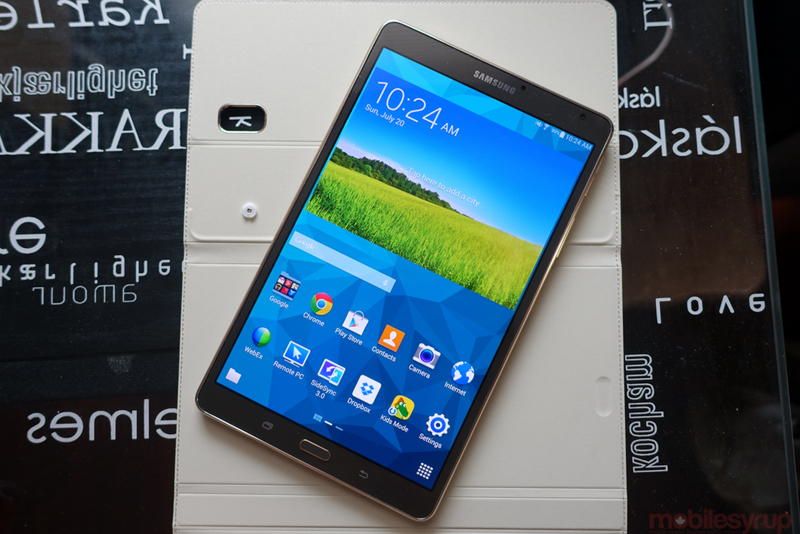 I unabashedly like the Galaxy Tab S, and believe that there are few better choices for an Android slate this size. The big question is whether it can compete with the equivalent iPad mini with Retina display, which offers a far superior app selection, better battery life and a smoother software experience. Both products are $419 for the 16GB WiFi model, so it stands to reason that comparisons will be made. If you’re a current Samsung user, features like SideSync 3.0, which mirror your phone calls and texts on the Tab S screen, are worth staying in the ecosystem for. But the reasons to buy a premium Android tablet are fewer than the equivalent arguments for a high-end smartphone, and while the screen is luscious and watching media a dream, one should still be weary of Android’s continuing growing pains in the tablet space.